In previous blogs I mentioned how both men and women who have an incontinence condition could help manage their condition by doing Kegel exercises, which are frequently referred to as “Kegals”. Kegal exercises for incontinence can be done by almost everyone and are easy to do, but I must caution you, if they are not done correctly, you will be wasting your time and effort. I promised that I would devote an entire blog to the subject, and that’s exactly what today’s blog is about. Kegel exercises for incontinence have been around for a very long time. Doctors or other healthcare providers usually introduce those who have incontinence to Kegel exercises. Maybe you have already heard about Kegel exercises from a friend or possibly by reading a magazine article. Even if you’ve heard about Kegel exercises before today, this blog will give you a better understanding of the subject. Kegel exercises are simple clench-and-release exercises. Although they can be performed during a regular exercise regime in your home or in a gym, they can be done almost anywhere and at anytime. Yes, even in your office when sitting at your desk or while watching TV in your living room or even while waiting in the check-out line at the supermarket. Before discussing the technique for doing the exercises, let’s first take a look at the parts of the body that benefit from Kegel exercises. The principal part of the body that benefits from doing Kegel exercises is the pelvic floor, which is made up of muscle tissue that is shaped in the form of a sling or hammock. The pelvic floor is located, as the name implies, in the pelvis area (the area between your hips). Below, you will see a diagram of this muscle tissue, which has a slightly curved shape (a sling or hammock shape). If you concentrate on the lower portion of the diagram, that is labeled “muscles of pelvic floor”, you will see the exact location of the pelvic floor and how it is supporting or holding the reproductive organs and bladder in place. It is when the pelvic floor muscle tissue weakens that one begins to see signs of incontinence. These pelvic floor muscles usually begin weakening as one ages, thereby, losing some of their supporting function. This is when the pelvic organs, especially the bladder, drop and urinary incontinence symptoms begin to arise. 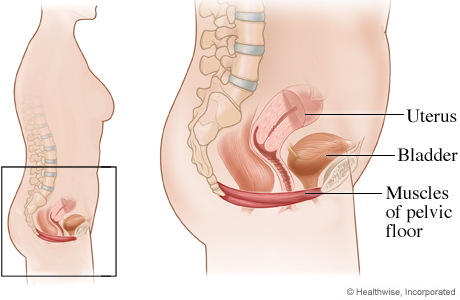 Besides aging, weakening of the pelvic floor muscles is also associated with pregnancy and childbirth. Examine the image on the right. As you can see, the bladder rests on and is supported by the pelvic floor muscle. Again, when that muscle loses its firmness and weakens, it drops, and as it drops the bladder, which it supports also drops with it, and signs of incontinence begin. This is a slow process, therefore, incontinence symptoms will be few at first, however, they will increase as the pelvic muscle further drops. Now that we know the important role the pelvic floor muscles play in maintaining normal urinary function, the question becomes, what does one do if those muscles weaken and drop resulting in urinary incontinence. That’s when Kegel exercises come into play. It is well known that doing Kegel exercises can benefit both men and women who have a weak pelvic floor. Since it is muscle tissue that has weakened, we know that almost anyone can strengthen muscle tissue by doing specific exercises. In this case, the exercises we must focus on are those that benefit the muscles in the pelvic area. This brings us to our next topic. How does one do Kegel exercises? The very first step is the most important step in the process. Before starting the exercises, you must locate the pelvic floor muscles and be sure that you have located the correct muscles. This is how you locate the pelvic floor muscles…when you are urinating, force yourself to stop the stream of urine midway through emptying your bladder. Feel the muscles that are being used in the pelvis area to interrupt the flow. Those are the pelvic floor muscles. They definitely are not the stomach muscles, buttock muscles or chest muscles. Repeat the process of interrupting your stream, until you are satisfied that you’ve identified the right muscles. To confirm that you have selected the right muscles, do a second test…pretend you are attempting to stop the passage of gas (flatulence) and feel which muscles you are using to hold back the gas…these are the same muscles you used to stop the stream of urine. By conducting these two tests, you can be satisfied that you have identified the pelvic floor muscles necessary to perform Kegel exercises correctly. Now you can begin the Kegel exercises (they can be done standing up, for instance after a shower, or lying down on your back in bed). Tighten your pelvic floor muscles, hold the contraction for five seconds, and then relax for five seconds. Work up to keeping the muscles contracted for 10 seconds at a time, relaxing for 10 seconds between contractions (if you count in thousand, each thousand is approximately 1 second, therefore, you would count 5 seconds as…1000, 2000, 3000, 4000, 5000). The contraction and relaxing should be felt in the pelvis area below your belly button. You should NOT not be contracting your stomach muscles nor your buttock muscles because those muscles are not part of the pelvic floor muscles. If you are confused about which muscles to contract, repeat the two tests (1) stopping your steam while urinating and (2) preventing the passage of gas. After you hold each contraction for a specified number of seconds, be sure to relax the muscles for the same number of seconds. Remember to count by thousands for each second. Find the best position for yourself. Start by squeezing or contracting for 5 seconds and relaxing for 5 seconds. Do this for 1 week. The second week add 1 second and continue to add 1 second each week until you are able to contract for 10 seconds and relax for 10 seconds. Repeat the exercise for 10 times each session. Aim for three sessions of 10 repetitions a day. For the greatest improvements for strengthening the pelvic floor muscles, it is best to practice doing Kegel exercises on a daily basis. Remember, they can be done anywhere, such as at home, in the car, on a bus, at school, in meetings, at work, etc. Note: If you cannot achieve the above suggested regime, reduce the number of repetitions per session or sessions per day to suit your personal circumstances. Readers of my blog are welcome to join Careway Wellness Center’s unique Tena Club. Watch the video and join today. When you’re a member of the Tena Club and you buy 9 packages of the same Tena product, Careway Wellness Center gives you the 10th package FREE. That’s more savings on Careway’s already low prices.